Seeing as I have been going to the annual reunion of the family that is Fairport Convention and their fans since 1988, making this years festival my 31st consecutive visit, I’m sure you can guess that I’m somewhat a fan of what is the best festival in the world. It is an event that I buy tickets for , each December, with the only certainty being that Fairport Convention will close the show, we’ll all sing about Meeting On The Ledge and have a bloody good cry; and whilst there reaffirm old friendships and make new ones, enjoy a few drinks, some great festival food and basically have a great time. At some stage, after buying my tickets, we will get dripped through a line up of acts, both new and exciting and old and familiar. Time will be spent researching the bands we’ve not heard of before, whilst getting excited by the acts we love (and having an odd moan, some of us, about the ones we are less enamoured of!) And that’s the beauty of this festival, the team that puts it together always do a fabulous job of getting the right acts on at the right time to compliment each other and to guarantee something for everyone to enjoy; and if there isn’t something to your taste, well there is always the ‘fringe’ in the village with great acts throughout the week playing in either the Red Lion or The Brasenose. And the fringe is where I’m going to start with my review of the acts that really impressed me. 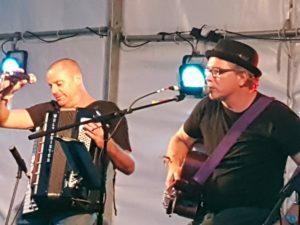 First up, the Irish music duo of Paul Mitchell (guitar and vocals) and Paul Tuthill (accordion, bodrhan and vocals) better known as Duff Paddy who seem to have become something of a tradition on the Wednesday night before the festival starts at The Red Lion. The lads, with their brilliant take on both traditional and contemporary tunes (Richard Thompson’s Tear Stained Letter and their ‘Irished’ up version of a Fairport fave, Paddy Groves are particular highlights) really do get the atmosphere kicking along, setting the tempo for what the festival comes over the next three days. Any early birds who can’t get tickets for the Trad Arr gig in Banbury really should pop along and see these two guys work their brand of magic. The Thursday bought for me a clash as the fringe put on a band, just overlapping the end of Fairport’s opening acoustic set and the start of the opening act, Smith and Brewer, that I felt I had to go and see. The band, Merry Hell, are the band that made me feel, for once in my short career, so far, presenting radio shows, like John Peel, as they sent me a couple of years ago one of their CD’s to listen to. I loved the CD and since then I’ve been waiting for an opportunity to see them live. Their live performances are gaining legendry status, and indeed the show they put on, at The Brasenose, lived up to those high expectations. Mixing traditional songs with a punk attitude, the band present themselves brilliantly, working the crowd to a fever pitch of dancing abandon, all the while singing songs of sadness, beauty, love (illicit, lost, unrequited, naughty and all points between) and also with a political message that resonates with the crowd the Cropredy festival attracts. This is a band that deserves, and would grace a bigger stage and crowd – Cropredy 2019 perhaps? 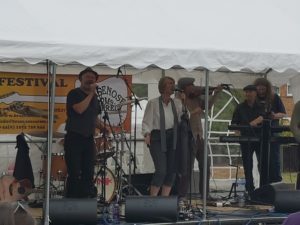 The Fringe also hosted some other fine acts over the weekend; good reports were heard about local Banbury band Leatherat’s reunion, Zal Cleminson (guitarist from the Sensational Alex Harvey Band) and also, on the Sunday IOTA, the trio of Anna Ryder, Marion Fleetwood and Sally Barker. But for me, the focus became the festival itself and ensconcing myself in my ‘spot’ (well after 31 years I kind of expect some sort of first dibs on where we all sit), with my family and friends, many of whom we meet, in the same place, each year, I looked forward to the musical treats we had in store. The first thing I will say is, that for me, this festival is so much more than a folk festival. This is a celebration of music. Yes it is primarily music that is folk influenced and lets not forget that the main reason for the festival is to allow 20000 people to show their love to the band that kicked off folk rock in the first place, but the variety of acts that appear have always been top notch, artistes and bands that are either at the top of their game, consummate performers who know how to put on a show or are bands just starting out on the road to, hopefully, bigger and better things. And this, to me, is what I gain as much enjoyment from as anything. What Fairport and the team do brilliantly is pick headline acts that will bring in numbers to make it financially viable to promote on a big stage younger bands who so richly deserve the exposure they get from appearing here. This years festival was no exception with the annual support of the BBC Radio 2 young folk award winner, this year harpist Mera Royle, opening the Friday and then great sets from the likes of Midnight Skyracer, The Travelling Band, Will Varley, Smith and Brewer and Police Dog Hogan. Every single ‘lower’ bill act belied their position and performed exceptionally well. And to a performer, every single one of them were genuinely pleased to be playing to the crowd, they interacted, and gained friends and followers through both their professionalism and enthusiasm. And speaking to some of the acts, during signing sessions after their sets, they were, to a tee, all overcome by the reactions they received from the crowds in attendance. Its certainly something that music could do with, the complete lack of arrogance and ego is so refreshing at this festival. One thing that always happens at the festival, though, is the appearance of an act that completely takes over the field, that owns the stage and is a complete and utter surprise. The first year Richard Digance got us all Morris Dancing will live long in the memory, Australian duo The Pierce Brothers and the remarkable reaction they got is another. This years stand out act was, though, three guys from Barnsley, wearing tank tops who performed hilarious parody songs. 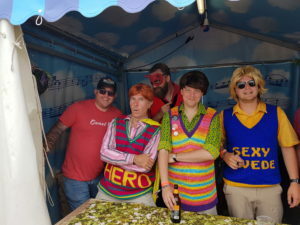 Starting with their mis-appropriation of a song by the Police, with the story being about visiting an establishment of poor repute in Amsterdam, Massage In A Brothel, the bar was set both simultaneously low, in the subject matter, and high in the sheer quality of their work by the Bar Steward Sons of Val Doonican. With the spirit of the Barron Knights, the attitude of a Carry On film and the sheer naughtiness of a Donald McGill seaside postcard, the Doonicans (Alan, Scott and their Swedish brother from a different mother, Bjorn Doonicanson) blasted through a set that included such moments of genius as (see if you can guess the original songs) Walking In Manpiss, The Lady In Greggs and How Deep Is Your Glove. The songs were performed with an innocence that belied the subject matters, an almost unbelieving acceptance of how well they were doing and an absolute joy of getting the vast majority of the crowd on their feet, setting the Saturday up, after what had been a miserable time weather wise, for the remaining bill. 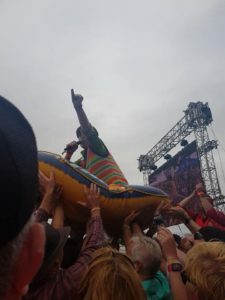 And to end the show by not only crowd surfing (unheard of at Cropredy) but to do it whilst rapping their version of Cypress Hills Jump Around, drinking a pint in a dinghy…well really you just had to be there. And hopefully they will return, they are not to be missed. Great stuff. But now to the major acts. And first up the Thursday night headliner. Much had been made about the late announcement, this year; I know Dave Pegg had been tearing out his hair having been almost constantly asked why the delay, who was it going to be, why hadn’t it been announced. But when it was, well, wow! 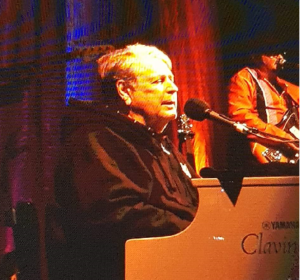 Brian Wilson of The Beach Boys performing his masterpiece of progressive pop, Pet Sounds. This was, I’m sure for many of us, a bucket list moment. Songs such as Good Vibrations, God Only Knows and Sloop John B were going to becoming to our little field in Oxfordshire; a little bit of California was going to brighten up our festival. Unfortunately, Brian hasn’t been in the best of health in recent years, both physically and mentally, and this told in his performance itself; but this reviewer found it very easy to forgive the issues Brian had. Hell, this guy has written some of the very best songs that have ever been written. And the band that was put together, including original Beach Boy Al Jardine, whose voice was on top form, his son Mike who took most of the high harmonies and totally owned them as well as the exceptional guitar playing of Blondie Chaplin (though his voice has shown the wear and tear of the years) really did the songs of Brian Wilson justice. Yes, it was quite sad to see a great man debilitated by his demons, but still the set they did was brilliant and certainly didn’t disappoint. Friday was a wet day, a very wet day and this meant we didn’t make it to see the headliners The Levellers. However, by all accounts the set they did, which was a more acoustic based one, went down brilliantly with those more hardy folks who stayed to the end, rewarding them with a typical high energy set. We did, however, see the long overdue festival debut of another act from Barnsley, the nightingale like voice of Kate Rusby who brought to the stage a wonderful selection of traditional and self-penned songs, all presented in her own uniquely endearing way. Kate has the fabulous ability to make any venue seem like the snug of your local pub on open mic folk night; telling tall tales and wondrous stories to punctuate her lovely, gentle and whimsical songs captivating every audience member with her utterly charming way of presenting songs. All of us, despite being soaked to the skin, thoroughly enjoyed her hour and a half on the stage, a welcome addition to the Fairport Cropredy family. For me, though, the act I was most looking forward to was the triumphant return of Fish who’d wowed the festival in 2014 when presenting the third album he recorded with Marillion, Misplaced Childhood. 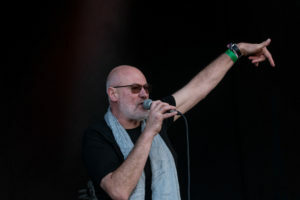 This time he brought a show based around the fourth and final Fish Marillion album, Clutching at Straws which he is presenting as part of his wind down to retirement along with work he is doing on his final solo studio album. Fish’s performance, however, was anything but winding down as he put in a storming set which included some solo numbers as well as the vast majority of tracks off Clutching; including songs such as Going Under which were rarely, if ever performed live back in the day, as well as a B-Side, Tux On, which has always been a favourite Marillion track. It is fair to say that I have seen Marillion with Fish, and Fish solo on more than many occasions; I have seen some amazing live shows by the Big Man. This show, on occasion, topped all of those previous ones; Slainthe in particular has not been bettered by him in many a year, Sugar Mice, judging by the amount of grown men around me (myself included) in tears, resonated in the sheer awesome emotion of the moment. And when you take into account the issues he had performing (please check out his blog here http://fishmusic.scot/stage-theres-no-place-hide-cropredy-festival/) his performance becomes all the more exceptional. I know in the blog he is hard on himself for perhaps not reaching the far ends of the field or those happy in their chairs, but the one thing you can say is that he tried his absolute best to entertain the whole field, something many other artists (though not at this festival) would do well to learn from. And for those of us at the front, we were wrapped up in a performance by a frontman who has always deserved to be mentioned in the same breath as some of the greats, The Freddie Mercurys, the Mick Jaggers, the Bruce Springsteens of this world. Great stuff. And so we come to the denouement of the festival, the performance by the band, Fairport Convention. Before that I feel that we should make mention of the two acts who preceded the main event. Both the Afro-Celt Soundsystem and folk legend Al Stewart performed amazing sets in seriously trying conditions; by the time both of them made the stage the rain had set in, the umbrellas were up and the cold had begun to bite. This didn’t stop both acts putting in shows of total professionalism, engaging the crowd and keeping us both warm and determined to see the night through. Open air festivals when the weather turns can be miserable places for both artist and audience; easy for either to bale out on. The fact neither did is testament to how well they both performed. 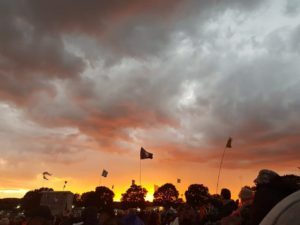 I, for one, would love to see ACS back to do a set in the sun – their energy and enthusiasm would be blindingly good as the beautiful Cropredy sun sets over Jonah’s Oak. But Fairport, how do they do what they do each year? How do they create a set that both sounds fresh whilst presenting the songs we all love so much, the ones we look forward to each year to listen to being played, that we sing along with, that we cry to, laugh to, dance to and just enjoy? Well, I couldn’t tell you how, I just know they do! And in some style always. This year did hold some poignancy with it being the 40th anniversary of the sad and tragic death of Sandy Denny. The band, as seemingly is becoming a talent of theirs, played beautiful tribute to Sandy with a lovely film show accompanying songs that had a particular resonance with Sandy; Fotheringay, It’ll Take A Long Time (featuring Winter Wilson), Fish perforning Solo and Iain Matthews singing Rising For The Moon all featured as did the wonderful Who Knows Where The Time Goes? The emotion was cranked up and the spirit of Sandy filled the field beautifully. But could the emotion get higher? Well yes it could as the culmination of the show was Maart Allcock, the former member whose guitar playing was one of the main reasons I first listened to Fairport, appearing with the band to perform Matty Groves and Meet On The Ledge. 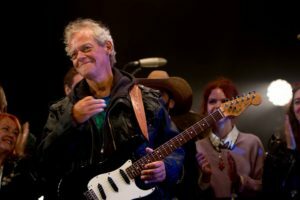 Maart, who’d popped up throughout the weekend, has recently announced that he has been diagnosed with terminal liver cancer; this Reunion was, for him, his chance to play one last time in front of the Fairport family, and then to move on out of the public eye. Maart firstly played an absolute blinding intro to Matty Groves before taking centre stage, with his immediate family and friends behind him and his wider family in front of him to play Meet On The Ledge one last time. And a beautiful, emotional and sensational moment it was with not a dry eye in the field. However, with Maart being Maart, there was still another little twist to come, another tear to be jerked, another notch on the emotional this goes up to 11 dial, with, as the song finished, Maart stepping up to the microphone and in his distinctive and inimitable Mancunian way he said goodbye before waving and walking off the stage. Well played Maart, a deserved send off and one many musicians could only dream of. No matter what you have in front of you, however long you’ve got you got to feel the love that floats over Cropredy every early August. And we all know in years to come Maart will be with us on that field, as Sandy, Martin Lamble, Swarb are along with those we all remember in our hearts on the ledge. So, all that remains is to say to all involved in organising this great festival and in particular Gerry, Simon, Dave, Chris and Ric of the band, our brilliant compere AJ Clarke and Gareth Williams thank you for continuing to put on an amazing event, bringing us all together in a spirit of friendship, love and music and for continuing to do so. I for one am looking forward to that date in December when I can purchase my tickets, look forward to the announcement of acts and count down the days to that great weekend in August. Excellent review and my sentiments exactly.